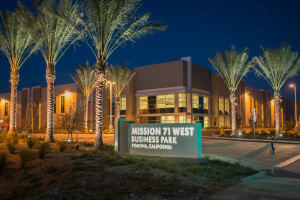 494,000 Square Feet (4 Industrial Buildings) In 2013, Seventh Street purchased 25 acres located on the west side of the 71 Freeway at Mission Boulevard in Pomona for development as the fourth phase of the Mission 71 Business Park. Seventh Street entitled the project and commenced construction in August 2014 on four new state-of-the-art manufacturing and distribution buildings. 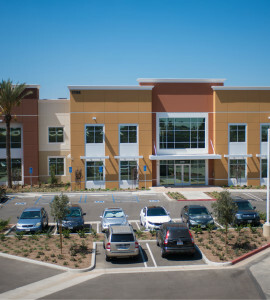 The buildings feature Freeway Signage, 30-foot clear heights (with the largest of the four buildings at 32 foot clear), ESFR sprinkler systems, large secure, all-concrete truck courts, and 6,000 square feet of high-quality two-story offices in each building. Construction was completed in the fall of 2015 and all four buildings were occupied upon completion to users including Konica Minolta, Kavo Kerr and Nu Sign. 245,000 Square Foot Corporate Headquarters and Manufacturing PlantIn 2012, Seventh Street purchased an 11.3 acre parcel from the US Government just east of the 71 Freeway at Mission Boulevard. 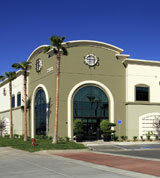 After procuring a Conditional Use Permit and full entitlements from the City of Pomona, Seventh Street completed construction in December 2013 on a 245,000 square foot state-of-the-art warehouse and manufacturing building with 32 foot clear height, ESFR sprinkler system, and 41 dock-high loading positions. 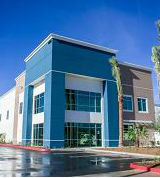 In January 2014, Kittrich Corporation made this building home for its Corporation’s Headquarters and Western United States manufacturing operations (http://www.kittrich.com). Kittrich has brought 220 jobs to Pomona through its expansion and relocation from La Mirada. Founded in 1978, Kittrich is a proven manufacturer and global provider of products for the home including housewares, yard goods, stationary, writing instruments, window fashions, and organic bath products. 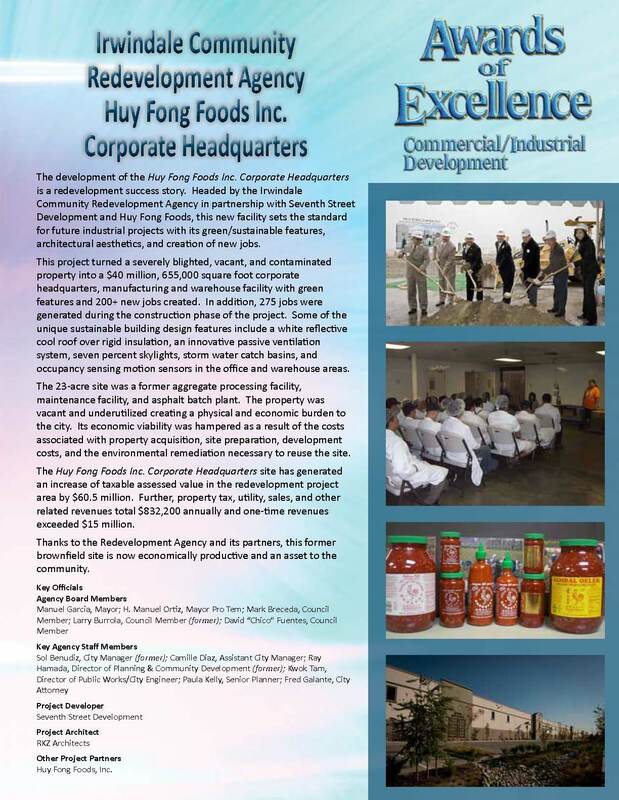 655,000 Square Foot Headquarters and Manufacturing FacilityRecipient of “2012 Los Angeles County Industrial Project of the Year – LA Business Journal” and “2012 California Community Redevelopment Agency Award of Excellence – Best Commercial/Industrial Project” Huy Fong Foods, one of the largest and best known manufacturers of hot sauces in the world, selected Seventh Street Development in February 2008 as development manager for its new headquarters and food manufacturing facility. The building at 655,000 square feet is the largest building ever constructed in the City of Irwindale and features sustainable design elements. Seventh Street identified the 23 acre site owned by the City of Irwindale Redevelopment Agency and negotiated a development agreement with the City. Construction began in October 2010 and the project completed in the Fall of 2011. Seventh Street was responsible for all aspects of the project including site selection and acquisition, entitlement, design, permitting and construction management. 191,000 Square Foot Multi-Tenant Industrial Park (12 Buildings)Waterman Business Center is a 10-acre ground-up mixed use development project located on the east side of Waterman Avenue, just south of the 10 Freeway in San Bernardino. In December 2007, Seventh Street completed construction on the project which consists of twelve buildings totaling 191,000 square feet. 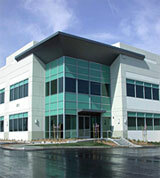 Ten of the buildings are freestanding industrial buildings which range from 9,500 to 16,000 square feet. Two of the buildings offer 67,000 square feet of multi-tenant office and industrial space, well-suited for a variety of uses that range from medical office to office showroom space due to the project’s abundant parking and close proximity to Loma Linda Medical Center. With their stacked stone entries and high-end office finishes, Waterman Business Center offers the highest quality buildings of its kind in this marketplace. 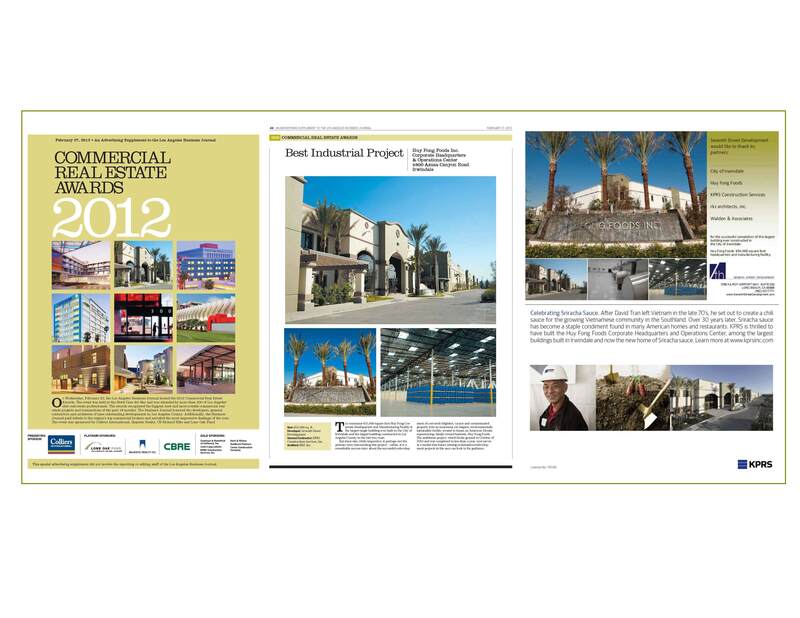 250,000 Square Foot Industrial Park in 11 BuildingsRecipient of “2008 Excellence in Development Award” from the City of PomonaMission-71 Business Park Phase I is an 11-acre industrial project located near the intersection of the 71 Freeway and Mission Boulevard. The site, which benefits from over 1,500 linear feet of freeway frontage, was formerly owned by the United State Government and occupied by General Dynamics as a manufacturing facility. Seventh Street completed the first phase of the project in December 2007. 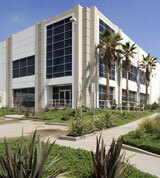 The 11 buildings totaling 250,000 sf were all occupied upon completion. 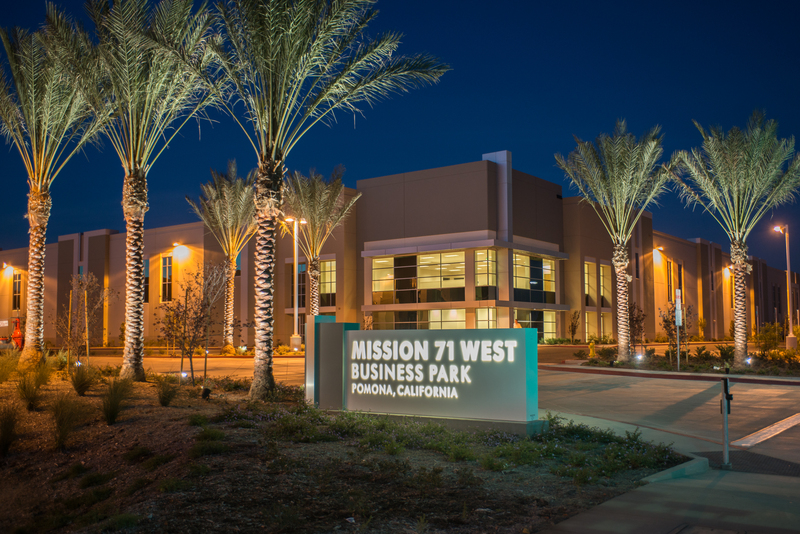 85,000 Square Foot Business Park (4 Buildings)The Speedway Business Park is a 4-acre master-planned industrial park located near the intersection of the 605 and 210 Freeways. The project successfully integrates the City of Irwindale Design Guidelines into an architecturally distinctive mission-style park consisting of four freestanding buildings totaling 85,000 square feet. Seventh Street Development was selected by the City of Irwindale through a competitive selection process to develop this irregular site which is just north of the Irwindale Speedway and adjacent to active mining operations. The buildings were completed near the end of 2006 and the project was sold out in early 2007. Single 110,000 Square Foot Industrial BuildingSeventh Street Development developed the first concrete tilt-up building, a 110,000 square foot industrial building located on a six acre lot, within the Agua Mansa Industrial Center. 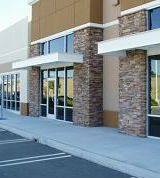 The building is a state-of-the-art 30 foot clear distribution facility with an ESFR sprinkler system. Seventh Street acquired the property in August 2004 and, after an extensive entitlement process in the County of Riverside and resolution of some complex utility service issues, the building was completed in October 2005. The building was constructed speculatively, but was sold at completion. 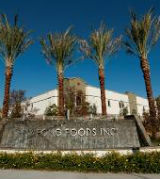 It is currently occupied by Aramark, a global leader in professional services such as uniforms and food services. 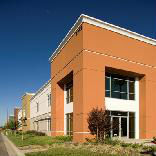 Seventh Street’s success with this development spawned numerous other projects within the Agua Mansa Industrial Center. 1.8 Million Square Foot Mixed Use Commercial DevelopmentFormerly Northrop Grumman’s development campus, The Exchange features 1.8 million square feet of retail, office, manufacturing and industrial space. The project’s master plan for the former 105-acre abandoned aerospace campus required a full environmental impact report, numerous public hearings and a close working relationship with the city of Hawthorne, two adjacent cities and the local community. The site also has known groundwater and soil contamination and is under active oversight by California EPA. Furniss and Hinchliffe identified this opportunity and led the team that acquired the property, developed the master plan and procured the entitlements, financing and tenants for the project.The project features 290,000 square feet of retail space including a Lowe’s Home Improvement retail store that opened in June 2003 and 500,000 square feet of new industrial buildings that were completed in December 2003. Additionally, two major users were procured for approximately 600,000 square feet of existing manufacturing buildings: AT&T, who located its largest data center in the country to The Exchange; and Lithographix, a local printer who will open a 275,000 square-foot printing operation with 400 employees in 2004. Agua Mansa Industrial Park is a 200-acre industrial property consisting of 24 semi-finished lots that accommodate a wide range of industrial and manufacturing uses. The project required a quick close, refinancing of a community facilities district with a tax-exempt bond offering, resolving an endangered species issue, as well as resolving several entitlement and marketing challenges. The refinancing and repositioning of the project were successfully completed in August 2003. Eighty percent of the property was sold or put under contract to users/buyers within one year of the purchase of the property. 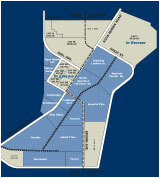 600,000 Square Foot Industrial Park (23 Buildings)The Alameda Trade Center is a 20-acre master-planned, industrial park. Mr. Furniss and Mr. Hinchliffe led a team that served as developer and general contractor for this 600,000 square-foot ground up development. It is located east of downtown Los Angeles within a City of Los Angeles redevelopment area. 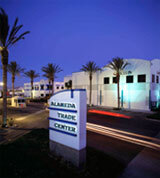 The Alameda Trade Center consists of 23 buildings ranging in size from 10,000 square feet to 160,000 square feet and was designed to address the unique requirements of importers/exporters, produce wholesalers, and frozen foods distributors. The team carefully crafted CC&R’s and three owner associations to create a highly successful business environment. Not only did all of the buildings sell out within 18 months of the project start, but also at record-high prices for the downtown market.